It should come as no surprise to anyone here, that Thanksgiving at the Made with HAPPY House is a big deal. I mean, what could be happier than spending the day in a house that smells incredible, surrounded by your family and friends? 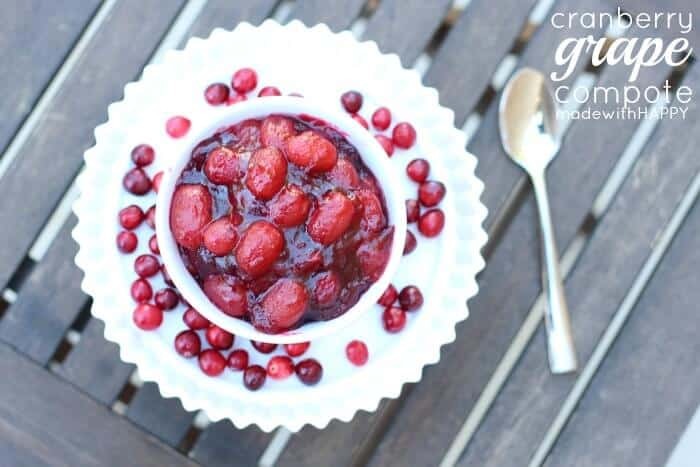 Well my cranberry grape compote will make it happier, that is for sure! For me, I love to cook the Thanksgiving meal. I typically ask my guests to bring dessert and or the wine, and I’m all about everything in between. At our house our meal is traditional and I would say about 85% of the dishes are prepared the same way our parents made it and our grandparents before them. I did, however, change up one of the Thanksgiving classics. 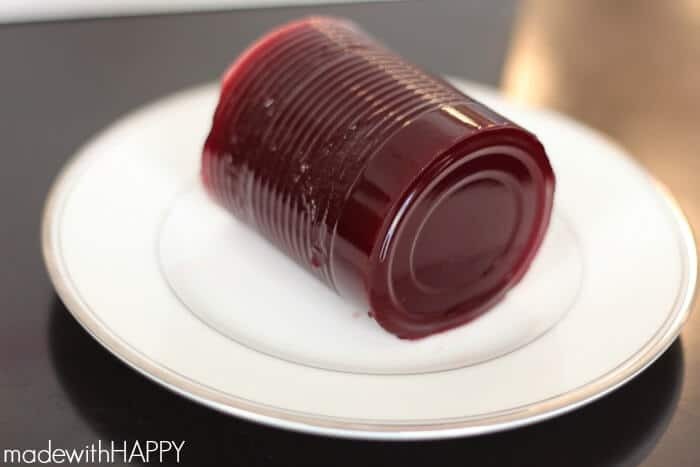 No offense to the millions of folks that love themselves a jiggly cranberry loaf out of the can, but I remember this plate being passed around our Thanksgiving table and there were maybe one or two out of 20 that would actually take some. That’s where I started to research and experiment. 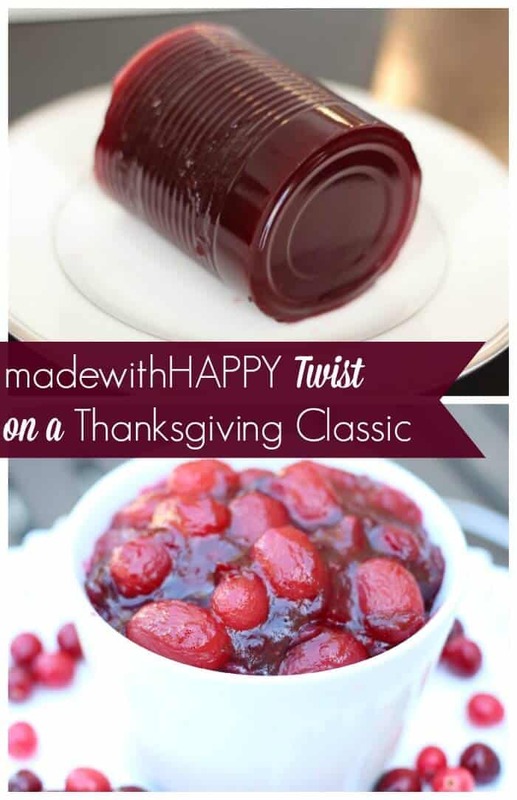 After a few different tries, we came up with HAPPY Twist on a Thanksgiving Classic. It is so good that for the last 6 years that I’ve made this dish, there is little to none left at the end of our Thanksgiving meal. Yep… it’s that good! Okay, here’s how you make it. 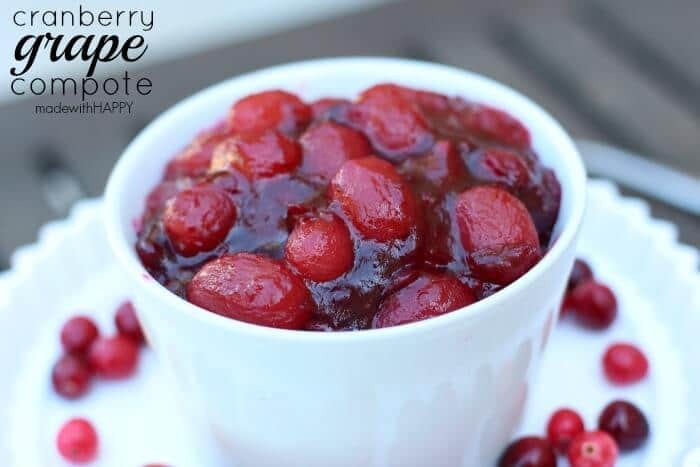 In a large sauce pan over medium to high heat, bring the cranberries, grapes, sugar and water to a boil. 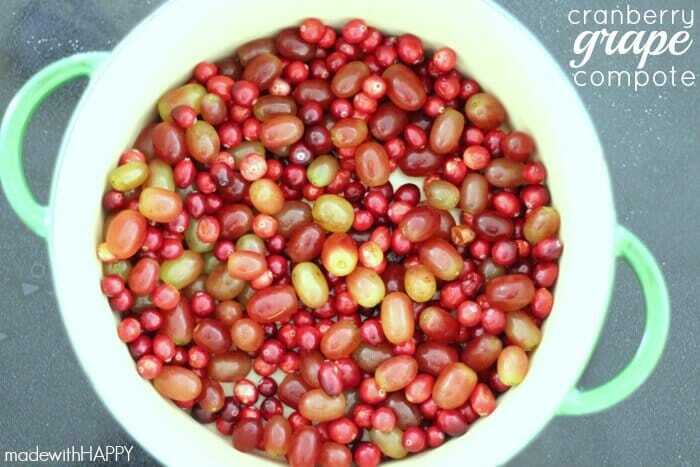 Reduce the heat slightly to a simmer and stir till the cranberries pop and the grapes are softened. Approximately 15 to 20 minutes. Remove from heat, stir in a pinch of salt and let cool. The best part about this dish is that it can be made in advance. It’s quick, simple and so tasty. 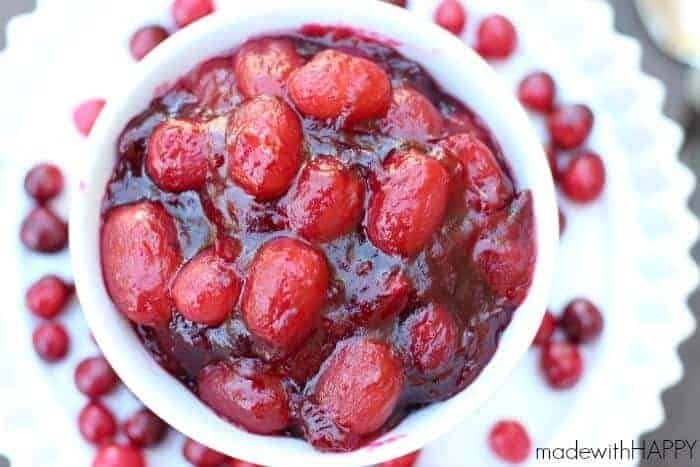 Plus you will never have to throw out a barely eaten jiggler of a cranberry dish. WIN! Happy Thanksgiving friends! 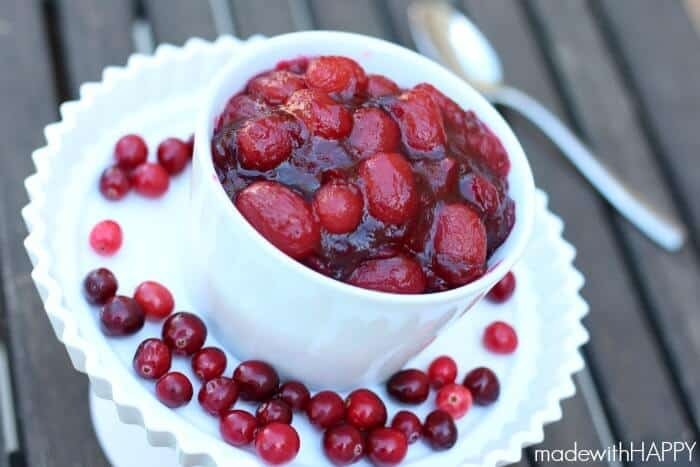 Blech, I always hated that canned cranberry sauce. 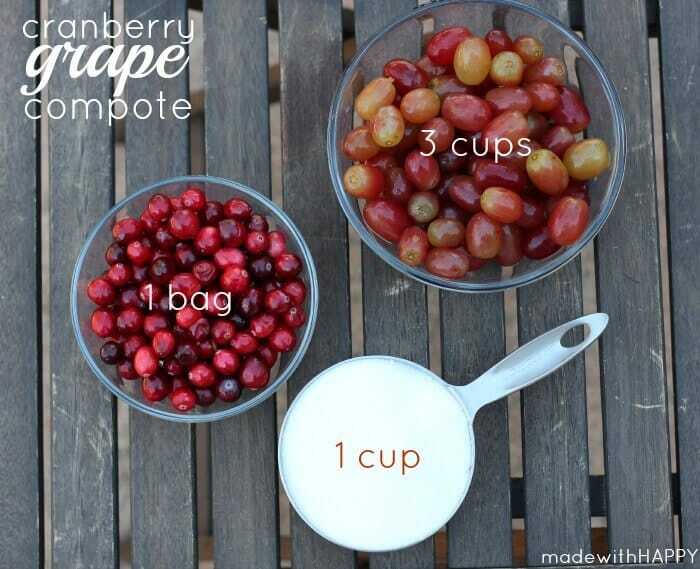 Thanks for sharing this alternative–I never thought of grapes as something that belonged on the table at Thanksgiving! Great twist on a classic. Thanks for sharing with us at #Throwback Thursday link party. Hope you join us again tonight..